Sylvia attended meetings (church) five time during the month and would have gone a sixth time, but she felt "indisposed" and "tarried at home" instead. Sylvia sewed 13 times and worked with a tailoress for a day. Sylvia was quite the social butterfly this month having called on or had visitors ten times. She even attended a ball at her Uncle Abel's house the day after Thanksgiving. 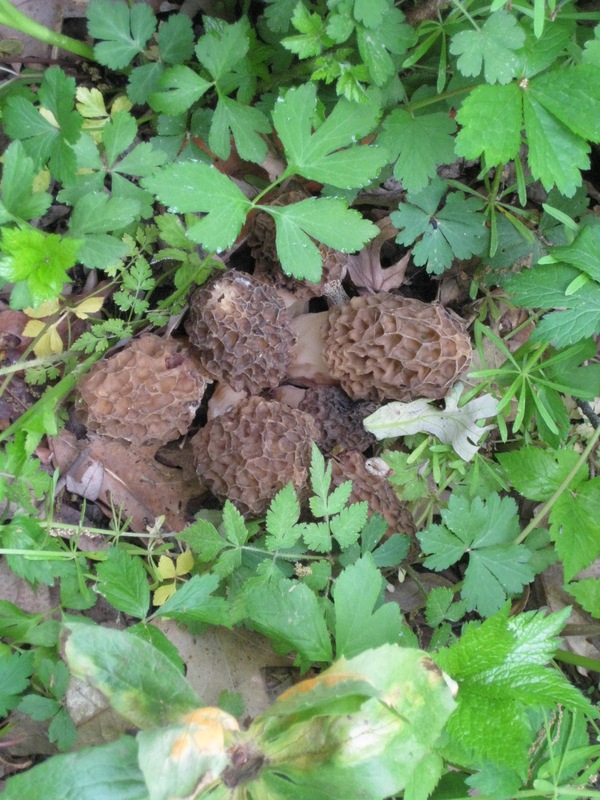 When I was young, one of my favorite things to do with my dad was to go morel mushroom hunting. Pops always seems most content in the woods and this was always a special time when we got to go "exploring" with him. Each spring we would grab handfuls of old shopping bags and then he would load us kids up in his truck. We'd roll the windows down in the truck and chatter away as we drove out to the woods. 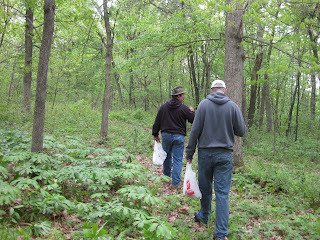 Once there, Pops would find us each a walking stick to help our little legs navigate the hills of the driftless area. Soon enough, we'd set off into the woods. Pops always gave a little speech at the beginning reminding us to watch out for critters (we were in their home after all) and then reminded us where to look for the mushrooms. We would spend hours walking up and down those hills, each of us trying to fill our bag the quickest (we are a very competitive group). Even though we were competitive about filling our bags, I never lost sight of the experience. I enjoyed the peaceful time in the woods most. There wasn't a lot of talking on our parts, but the hills in the driftless area have a sound of their own and it is quite amazing. I'm not even going to try to describe it, as I won't do it justice, but if you ever venture that way you will know exactly what I mean. Dad and James walking the ridge line. Hunting the mushrooms was special experience, but so was eating them! The worst part was waiting for them to soak as it took hours, but when they were ready to be eaten mom or dad would start frying them up. 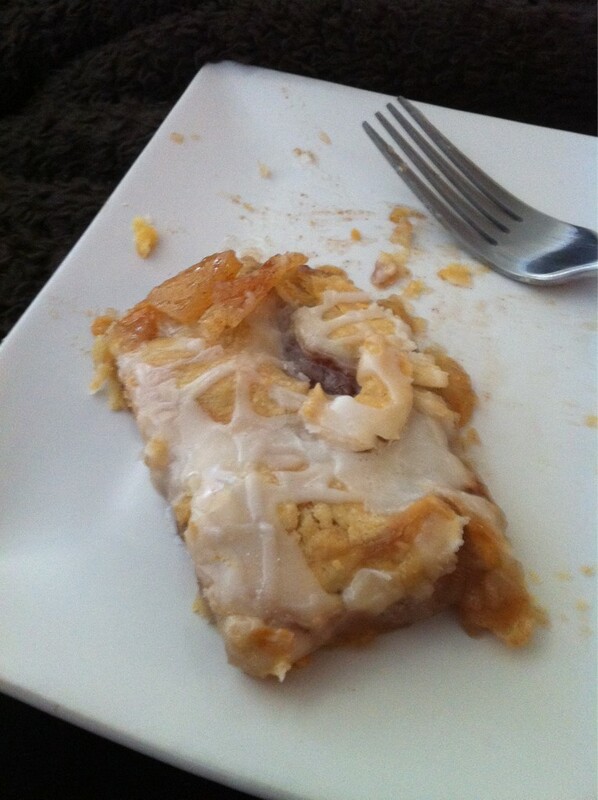 They are best when hot, so we'd all sit around the island in the kitchen waiting for each individual batch to finish and then in mere seconds they'd be gone. I always wished the season was longer, but all good things must come to an end, right? A couple years ago, my husband and I happened to be visiting my family during morel season. I, of course, jumped at the chance to get back into the woods for a couple hours and I was even able to convince hubs to join us too! 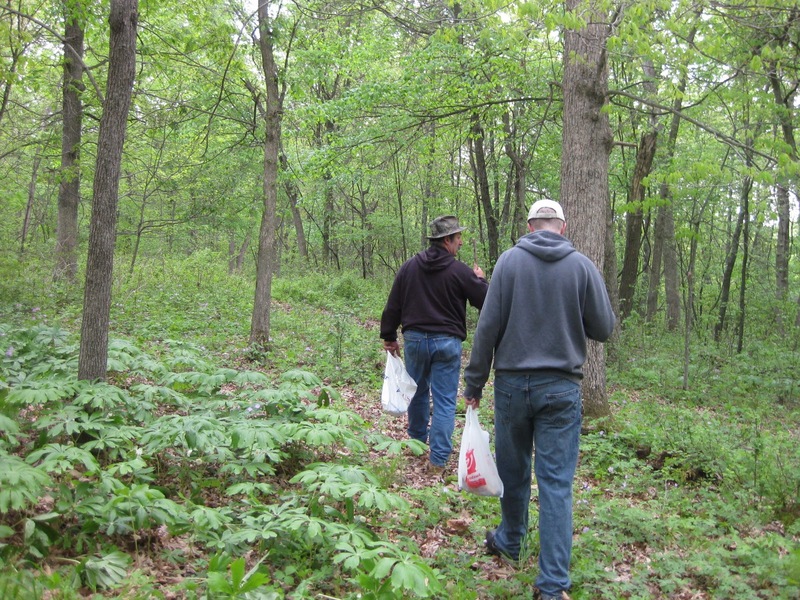 It had been years since I had been mushroom hunting, but it was just like I remembered it being. Peaceful togetherness. Sentimental Sunday is one of the many blogging prompts supported by www.geneabloggers.com to help genealogy bloggers record their family histories. BRIGGS: Wisconsin (Crawford County) 1856-present; Ohio (Morgan County) 1824-1860. DYER: Wisconsin (Grant County) 1856-present. GRAY: Wisconsin (Crawford County) 1880-present. HANSON: Wisconsin (Richland County) 1870-present; Norway Pre-1870. HASKINS: Wisconsin (Iowa County, Richland County) 1860-present; Vermont Pre-1860. HEISZ: Wisconsin (Crawford County) 1850-present; Germany (Prussia) Pre-1870. HORTON: Iowa ( Jones County, Madison County) Pre-1900; Wisconsin (Richland County) 1910-present; Vermont (Franklin County) Pre-1860. JERRETT: Wisconsin (Crawford County, Grant County) 1850-present. LINDLEY: Wisconsin (Iowa County, Richland County) 1910-present; Iowa (Jones County) 1850-1910; Indiana (Warren County) 1830-1850; Ohio (Butler County) Pre-1830. LOMAS/LOOMIS: Wisconsin (Grant County) 1845-present; United Kingdom (England) Pre-1845. MILLER: Wisconsin (Crawford County, Richland County) 1880-present; Ohio Pre-1860. MOOK: Wisconsin (Crawford County) 1850-present. STOHER: Wisconsin (Crawford County) 1870-present; Austria Pre-1880. TYLER: Wisconsin (Clark County, Richland County, Wood County) 1880-present; Ohio (Trumbull County) Pre-1860. WILKINSON: Wisconsin (Crawford County, Grant County) 1850-preset; United Kingdom (England) Pre-1850. WOOD: Wisconsin (Crawford County, Grant County) 1860-present. Thomas MacEntee, the mastermind behind www.geneabloggers.com, has revived Craig Manson of GeneaBlogie's meme from 2009.